Yearling Cubes are particularly suitable for those youngstock being prepared for the sales or show ring or Thoroughbred yearlings going into training as two year olds. Being highly digestible and energy dense they allow for the delivery of the required non-heating energy and supporting nutrients in a reduced volume, thus helping to avoid overloading the digestive system or exacerbating excitable temperaments. Like all Baileys cubes, they are barley-free and formulated to promote outstanding muscle tone and condition whilst containing vitamins and minerals, including chelated (Bioplex®) minerals, to support continued growth. 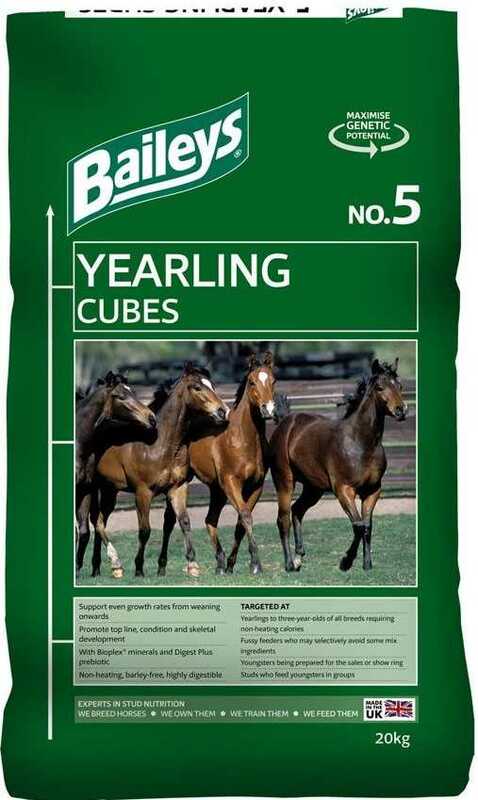 Like other products in Baileys’ Stud Range, Yearling Cubes can, where necessary, be fed in reduced quantities alongside Stud Balancer to cut down the overall calorie content of the diet whilst maintaining essential nutrient levels. The following table suggests quantities of Yearling Cubes to be fed in pounds and kilogrammes per day when feeding ad lib good quality forage.